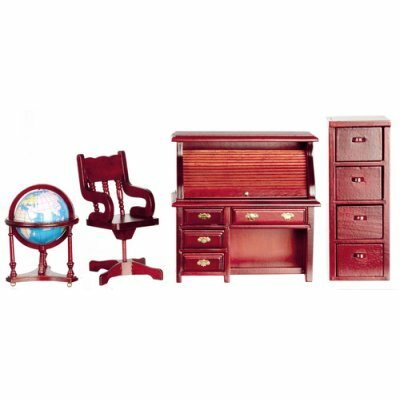 This 1:12 scale Mahogany Office miniature set includes a stunning roll top desk, wooden file cabinet, globe with wooden stand and a great old fashioned wooden office chair. The rich Mahogany tones of this miniature office furniture set will look great in your 1/12 dollhouse office or study. This Mahogany Office Furniture Set 4pc is supplied by Aztec Miniatures, which generally ships within 8 business day(s) of you placing your order .